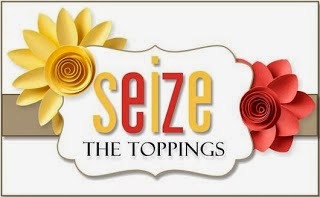 Time for our latest challenge at Seize The Birthday, and this time it's an optional topping of flowers. The sentiment stamps are from the new release by STAMPlorations. 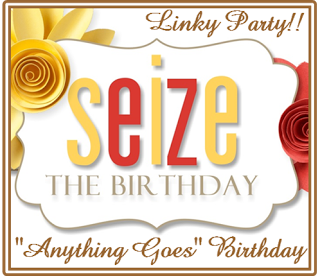 Pop on over to Seize The Birthday for a look at the fabulous cards my teamies have created, then join in the fun! I'm entering this card into Simon Says Wednesday Challenge - Spring Flowers. Wowie - the encaustic master is at it again. I just love how you do that. This is stunning! So glad you linked the tutorial video. Looks like such a fun technique. Good grief, how sensational - very, very creative! OMG! I was scrolling through the DT showcase from STB post and did a double take on your card! This is so super AWESOME!! I'm definitely going to check out your tutorial! TFS!! I apologize that I've haven't stopped in for a while...seems like a problem with my notifications! This is such a stunning card, Shirley! I love how you created depth in your landscape and the colors are just beautiful! Thank you so much for the link to the video! That is one fantastic background. sort of surrealistic. Perfect for the flowers. Excellent. WOW! WOW! WOW! I see another shout out for this AMAZING, FABULOUS card!! Holy Moley! That is gorgeous! That background is incredible! Amazing work! The scene you've created is amazing! I have GOT to go watch the video to see how to do this. Shirley, Your an amazing artist girl! Really beautiful background you created! Have a great week! Wowzers, this is gorgeous! I love how you have created the background for this card. Love the stunning scene you created! Stunning card! Ooohh this is awesome, and I MUST have this stamp set NOW!!!!! You enabler you, call it divine inspiration, but I think I still need that set!!! !